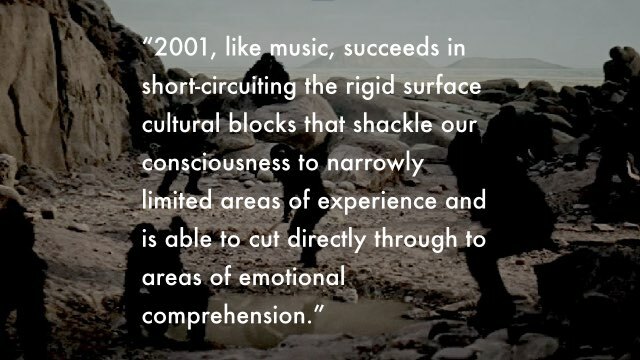 "2001, like music, succeeds in short-circuiting the rigid surface cultural blocks that shackle our consciousness to narrowly limited areas of experience and is able to cut directly through to areas of emotional comprehension." It was made in 1968, and it's one of my favourite movies, the first movie I can actually consciously remember watching any of. I must have been six years old. There's a great interview with Kubrick where he talks about 2001 being a modern movie, one that goes beyond the idea of "talkies" and that it's very visual, which is something that young people get instinctively. That quote is from Kubrick, from that interview. He mentions a film critic who got confused because Floyd says out loud that he's flying to Clavius, which is a lunar crater, and it's following by a sequence of fifteen shots of landing on the Moon. And the critic is confused because she thinks Clavius is a planet. Kubrick says that this is because she is used to the idea of talkies. But young people, he says, take the visual medium for granted, and they know Floyd is going to the Moon because they see Floyd going to the Moon. If you haven't see 2001 then I should explain that it's slow and beautiful with little dialogue. It's also quite abstract in places, and very spiritual. It can be read in lots of different ways. When Kubrick says it's more like music, or a painting, I totally see that. I think of it like a poem. Source: An Interview with Stanley Kubrick (1969) by Joseph Gelmis.